Photograph copyright by Kevin Cronin, and used here with his knowledge and permission. Bernard Bradley Barry, was the son of James M. & Louisa (Murphy) Barry. His parents were born and married in the Berkshire area of Massachusetts, removing to Manchester, New Hampshire by at least 1887 when James is shown as an ‘engineer’ working for the Union, the local newspaper that would later become the well-known “Union Leader.” They lived in a house at 371 Central Street, probably in the house standing there today. Likeness of Bernard Bradley Barry, a Manchester native who died 16 Oct 1918 at Argonne Forest, France (World War I). Photograph property of Janice W. Brown at Blog: Cow Hampshire. Please do not reuse without her permission. Bernard B. Barry was born 26 February 1893 in Manchester, New Hampshire, as the 6th and last child born. All of his siblings predeceased him at an early age. No doubt Bernard attended the local Manchester schools to receive at least a basic education and was literate, for in the 1910 U.S. Census he is shown as a printer’s apprentice, probably to his father who was a pressman for the newspaper. By June of 1917 when Bernard signed his World War I draft registration card, he was working as a fireman for the City of Manchester. At the young age of 24, he served his country as a private in Co 3 309th infantry, 78th Infantry Division. His division took part in several events and battles of World War I, including The Meuse-Argonne Offensive, also known as the Maas-Argonne Offensive and the Battle of the Argonne Forest. 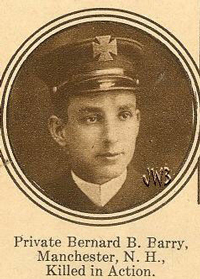 It was at this time, on October 16, 1918 that Bernard B. Barry lost his life in France, first considered missing in action, and then in November records listed as “killed in action.” On that day his parents also lost their only living child. 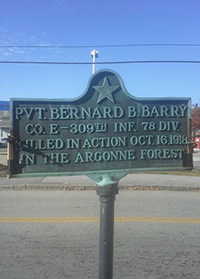 Bernard B. Barry’s name was listed in various newspapers, one in particular, as “American Army Casualties on Liberty’s Battlefield.” In October of 1940 the Mayor and Board of Alderman of Manchester NH passed an ordinance that stated: “That the Square located in East Manchester, where Lake Ave., Hall and Massabesic Streets intersects and commonly referred to as Gilman’s Corner, be officially designated and known on all Official Records and Maps of the City of Manchester as “Bernard B. Barry Square.” In addition, a small monument was placed in St. Joseph Cemetery in Manchester, New Hampshire.